We’re partial to breakfast around this house. In fact, we like it so much that the hubs and I take breakfast dates because it could be one of our favorite meals of the day. The other reason, well our kids are actually sane in the mornings and not out of control tired so its easier to find someone to watch them. #truth So it comes at no surprise that we like to dress up breakfast a bit. I mean take it up like 10 notches from just plain eggs. 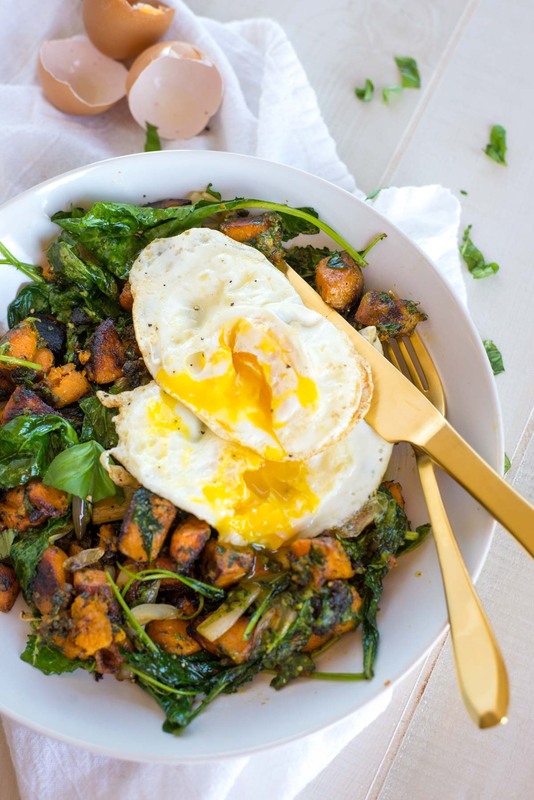 Don’t get me wrong we love eggs, but they are so much better on top of this delicious caramelized spring onion, kale and sweet potato breakfast hash with chunky pesto (wow, that was a mouthful). I’m not kidding you, this is the best breakfast hash I’ve made to date. And if that hasn’t sold you I may have eaten if for six strait meals, ahem. I mean don’t blame me, you would do it too. Okay good, I didn’t think so. 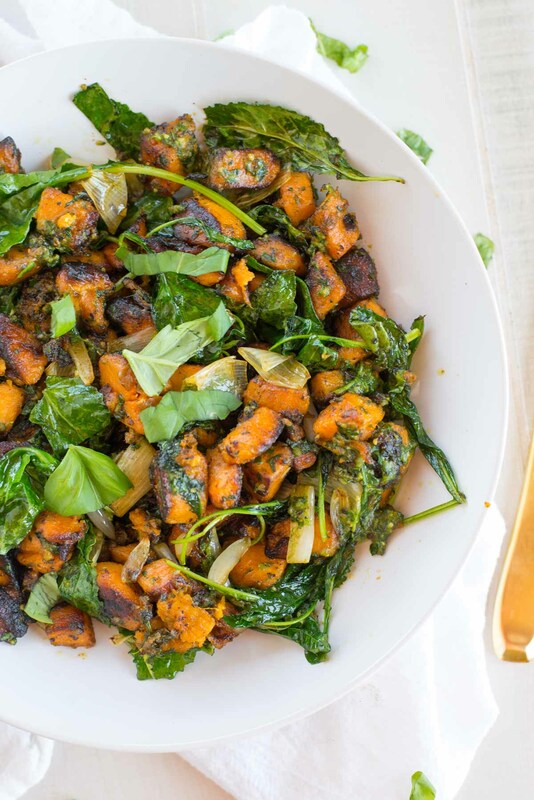 But who wouldn’t love crispy fried sweet potatoes with caramelized onions and wilted kale topped with this delicious magic? Everyone loves it and it makes breakfast so much more enjoyable. The time of day when my kids are groggy and overly irritable, generally fighting on the couch at who has more blanket. Or better yet, the occasional time when one girl has put on someone else’s clothes for the day and we have our daily fight over clothes. <-which who knew girl problems started so young? There’s also the horrific times when someone accidentally knocks over mom’s warm tea latte (a.k.a. mine) that she lives for in the mornings and the house grows silent in concern for the awful mom meltdown that could occur at any time. It’s just tea… it’s just tea… I can make more…. but I don’t want to make more I want my tea!!! Okay, am I a horrible mom or do other moms have pity parties over silly things like spilling of hot tea too? I mean milk, juice, no problem. Mom’s tea and whoa we have a whole different set of problems that are escalating very quickly. So as you can see mornings are superb around here. We’re generally 10-15 minutes late to everything because no one has an agenda but me so taking 10 minutes just to pick out a shirt also seems to not be a problem for anyone but me. Thats why I love myself a nice warm and savory breakfast. Something to end the morning “hanger” and bring a little bit of satisfaction to my day. To sit down, block out the noise and just enjoy the 10-15 minutes that it lasts… on a good day. 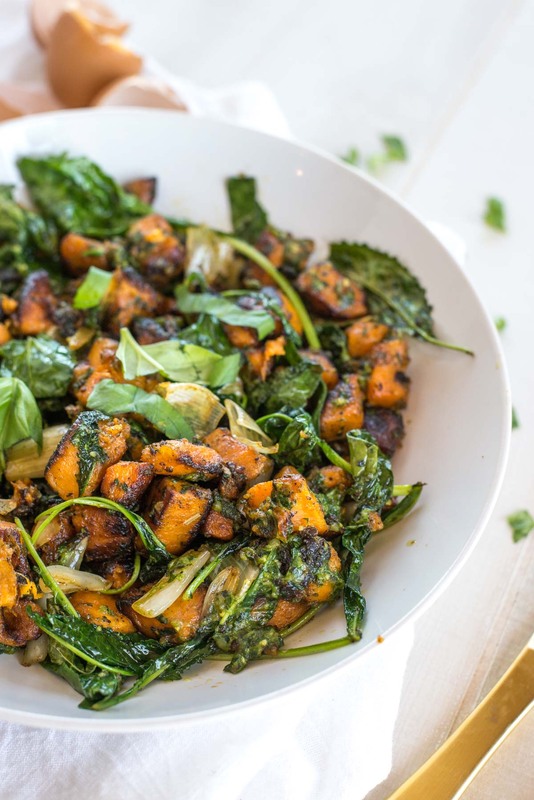 So you’re probably now concerned that this sweet potato and pesto hash isn’t reeeaallly as good as I’m telling you but I just think it is because it’s generally better than what’s happening around me. I have to tell you’ve I’ve eaten this with kids and without kids around and it is even better by yourself. Seriously, that good and this is coming from the well-rested, showered and dressed Alexa. Not the crazy, just-surviving mom. 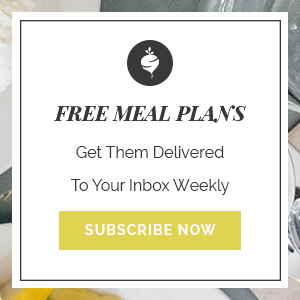 Now that we all feel better about things, lets just agree that you’re going to add this to your weekly meal plans and try it out for yourself. By the way, you’re not a breakfast fan? Don’t worry, I’ve got all the dirty deetz coming to you next week which may change your perspective on breakfast. 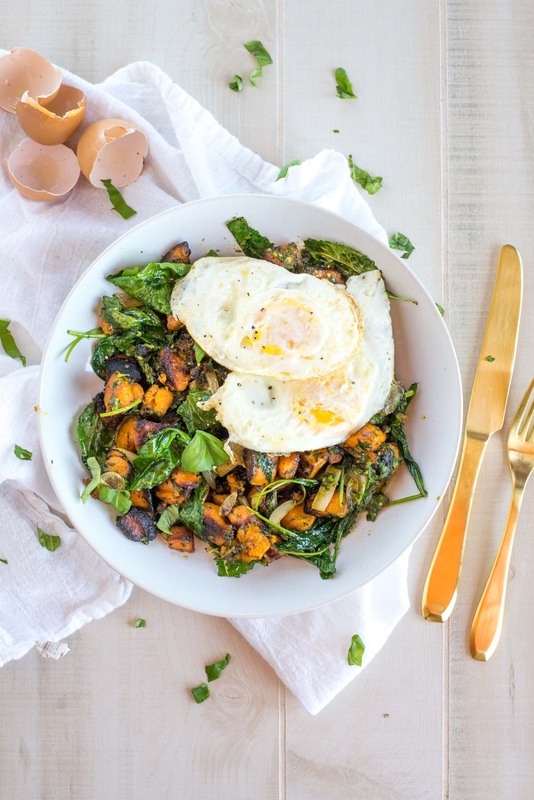 But for now note that you wouldn’t just have to make this for breakfast. I’d say it would be good any time of the day. I mean not that I would know…. Peel and cube sweet potatoes. Roast in the oven or cook until just tender. Meanwhile, heat a large skillet over medium heat. Add in 2 Tbsp coconut oil or olive oil. Once hot add in cubed sweet potatoes and cook until crips, stirring occasionally (may have to cook in batches). Add the remaining 2 Tbsp oil along with the halved spring onions. Cook until just beginning to caramelize and add chopped kale. Add back in the sweet potatoes along with 2 Tbsp butter. Place in a bowl and top with pesto (that was left chunkier). Mix well and enjoy topped with an egg, sausage or white beans.